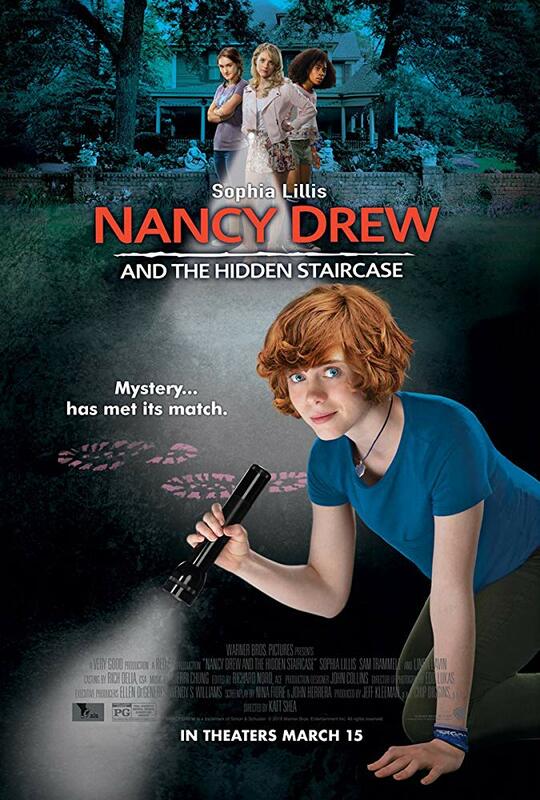 Movie: "Nancy Drew and the Hidden Staircase"
Amateur sleuth Nancy Drew investigates a haunting of the old Twin Elms house and uncovers a bigger conspiracy that is much more dangerous than ghosts. The Nancy Drew novel "The Hidden Staircase" was first published nearly 90 years ago in 1930. Warner Bros. initially adapted that book into a film in 1939, which was directed by William Clemens. Needless to say, it's a little surprising the studio waited 80 years to reboot this feature. Is that some sort of Hollywood record? This time around, the story has been tweaked into a more modernized girl-power version of the story. "Nancy Drew and the Hidden Staircase" is directed by Katt Shea, who is less known for making kids movies and more known for directing exploitation horror and thrillers like "Stripped to Kill," "Poison Ivy," and "The Rage: Carrie 2." The same can also be said for the writers Nina Fiore and John Herrera, who have both worked on TV series like "The Vampire Diaries," "Blood Drive," and "The Handmaid's Tale." A script like this is certainly a different venture for all of them. The movie tells the story of Nancy Drew (Sophia Lillis), who has just moved from Chicago to a small town called River Heights where she used to only visit for the summers. After getting in trouble for helping a friend take revenge on a school bully who harassed her online, Nancy is intrigued by a story she overhears at the police station. A woman named Flora (Linda Lavin) tells her that her house, the old Twin Elms place, is haunted, and claims that she has been experiencing supernatural phenomenon for a while now. Flora is the great aunt of Helen (Laura Wiggins), who is dating the bully who harassed her friend. Despite this, Nancy offers to help, and she and Helen agree to a truce so they can help her aunt, but what Nancy eventually uncovers is a lot more dangerous and more realistic than ghosts. It came as no surprise to us when we learned that Katt Shea has made a lot of straight-to-DVD and made-for-TV films in her career because "Nancy Drew and the Hidden Staircase" definitely has a made-for-TV feel/straight-to-Netflix feel. It seems like the kind of movie that would have been a '90s Saturday morning special as opposed to a film with a limited theatrical release, especially considering it got virtually no marketing. This isn't necessarily a bad thing, and that doesn't necessarily mean it's low-quality, but the narrative does almost feel episodic, like it should be a TV pilot for an ongoing series, one we are shocked to say we totally would have watched! Let's start with the not so good. There are a lot of elements here that are supremely cheesy. Some of the dialogue is really rough, and the acting is pretty stiff from a couple of the performers. The drama and conflict between the girls always feel forced, and the heart-to-heart/serious talks come complete with canned sad music that adds to its slightly unnatural feel. That being said, the mystery aspect is still fun despite being utterly predictable. We found ourselves actually getting involved with the haunting of Twin Elms, and we liked watching Nancy uncover the mystery of it all. Even though we were sure of the destination, the journey to get there managed to be pretty dang fun. We think Sophia Lillis once again shows that she is remarkably talented. We enjoyed her performance in the "It" remake, and here, she proves that she is going to be a talent to look out for in the future. Linda Lavin is also spectacular as the zany, raucous aunt Flora, and we need to replicate her home decor stat. In the end, we left the theater satisfied (and shocked!) by "Nancy Drew and the Hidden Staircase." We were mostly entertained by this feature and think it will be one that young kids and teens can enjoy. It isn't the type of film that demands a theatrical viewing experience, but we recommend checking it out when it becomes available on Redbox/DVD/streaming services.